Who is Eric Shivers ? Eric is the author the of “ I’m a Fan: How I married U2 into my life without going to the altar.” Eric has had some challenging times in his life. The book dives into how U2’s music embarks him on a journey of self-discovery. 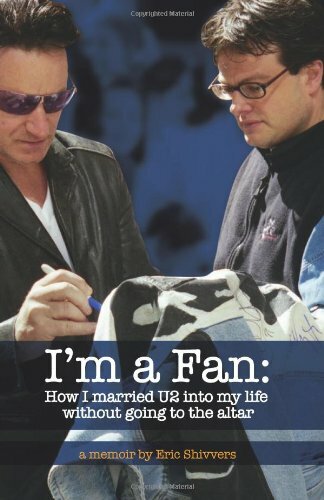 Eric said “How I married U2 into my life without going to the altar is the story about how my parent's divorce changed my journey through the world for the better and how I became a fan of the Irish rock band -- U2. Starting with my mom's second marriage to the closing chapter with me sitting on Oprah's couch shortly before Bono takes the stage, I'm a Fan is a 35 year romp through my life trying to understand one's difficulties with relationships, depression and death as U2 sits in the background playing my soundtrack.” From self-discovery listening to U2’s “Under A Blood Red Sky” cassette to sending the band a bag filled with custom painted jean wear initiating a merchandising operation to meeting them on the streets of Chicago, I'm a Fan: How I married U2 into my life without going to the altar is my life's story.